Severe cyclonic storm ‘Vardah’ will make a landfall between north Tamil Nadu and south Andra Pradesh on Monday with both the coastal states putting in place a number of measures to deal with it and TN announcing holiday for all educational institutions in four districts. The Regional Meteorological Centre said ‘Vardah’ lay centred at 330 km east of Chennai at 1430 hours on Sunday and would move westwards before making landfall between north Tamil Nadu and south Andhra Pradesh coasts Sunday afternoon. 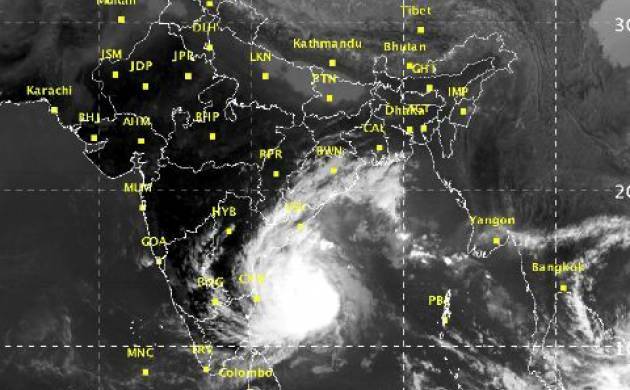 Under its impact, rains will start on Sunday night and gradually increase on Sunday in the northern districts of Chennai, Tiruvallur and Kancheepuram, S Balachandran, Director, Area Cyclone Warning Centre, said on Saturday. On December 12, heavy to very heavy rains were likely in some places in these districts, he said, adding, strong winds could gust upto 80-90 kph. The sea would be rough, he said and asked fishermen to not to venture into the sea for the next 48 hours. Chief Minister O Panneerselvam held a meeting of the Tamil Nadu State Disaster Management Authority which also asked the armed forces to be on standby. The Tamil Nadu government declared holiday for educational institutions in Chennai, Kancheepuram and Tiruvallur, besides coastal taluks of Villupuram. “They should take necessary steps for ensuring the safety of their students especially hostel inmates and their water and food requirements,” an official release, detailing the discussions the Chief Minister had with his senior officials including Chief Secretary B Ramamohana Rao, said. Andhra Pradesh Chief Minister N Chandrababu Naidu reviewed the situation through a teleconference with Collectors and top officials this evening. He directed them to be alert and undertake necessary rescue and relief efforts in view of the cyclone threat. Food and other essential commodities should be kept ready in adequate quantities, he said. “Take all steps to prevent loss of lives and to minimise damages to crops and properties,” Naidu told the officials. Tamil Nadu Government also asked private establishments and undertakings in these districts besides coastal taluks of Villupuram to allow their staff avail holiday or work from home. Panneerselvam gave instructions for appointment of senior IAS officers as monitoring officers for these districts to oversee and monitor cyclone related works in coordination with the District Collectors, the release said. “Arrangements to be made for evacuating people in low lying and vulnerable areas. Relief centres to be kept in readiness along with necessary food, water and other arrangements. Army, Navy, Air-force and Coast Guard have been alerted to be on standby for deployment as and when necessary,” it said.